Information technology (IT) has become a mainstay of health care provision. According to the Office of the National Coordinator for Health Information Technology, 96% of all hospitals in the United States, as of 2015, used certified electronic health record (EHR) technology. Added to that, more than 60% of office-based physicians in the United States "demonstrated meaningful use of certified health IT" as of 2016. Such use of technology opens doors for better communication and data sharing among coordinated and integrated care providers, for example, as well as more efficient billing capabilities. But an increase in use does not mean that all runs smoothly all the time. Challenges exist and persist in the employment of health IT. To best find solutions for these challenges, one must first recognize and understand what the obstacles are and why they should be overcome. Despite the prevalence of technology across health care providers, one of the more common challenges to uniformly and effectively employing available tools is end user buy in. When providers don't see the benefit in use and, thus, don't use the resources available, even the best technology will be rendered obsolete. Where does this reluctance stem from? Some of it is simply a matter of time, says Kara Doone, business analyst for the Colorado Community Managed Care Network (CCMCN). "A lot of end users barely have [extra] time in their day or don't have [extra] time in their day," she says. What's more, they are often already documenting and inputting data into a variety of locations. "That's the biggest obstacle," she notes. "The minute you say it's another application to log into, everyone turns their head the other way until or unless value is proven." In addition to time, a common concern among providers is liability. Technology is well ingrained in today's society, and most individuals share more data daily than they realize. However, that doesn't mean there aren't perceived risks involved in sharing medical information. Often, those perceptions can get in the way. For example, says Joseph Parks, MD, medical director for the National Council for Behavioral Health, most payers want to receive information from providers but don't give it back. This one-way street exists for a variety of reasons, but one of them is fear. "They are paralyzed by fears of liability," he notes, adding that it is unnecessary. "At a federal level, HIPAA allows you to share information for the purposes of treatment." Even when a given application is embraced and concerns about liability are lessened, there is a cost—potentially in both time and money—to ensuring that data are input and collected correctly. "It requires another level of effort and care," Parks says. "Often what you want to know isn't in the standardized part of your medical record." In that case, the end user may create special fields within an application or system to record the desired data. "[But] a lot of the time, whoever did that will not tie those fields back into the master table." When that occurs and data are pulled, the results fail to provide an accurate picture of what has happened or is happening. Once collected properly, providers or networks also need to make sure they know what to do with the information. "You have to invest in people who know how to do data analytics. Your managers have to get used to making decisions that are data based and data driven, as opposed to using their gut," Parks says. Thus, buy in must happen on multiple levels for effective data sharing. Providers must not only be willing to use an application but also to learn it and function effectively within it. Beyond buy in, a common challenge in effective use of technology to share data is the simple fact that external communication—between varying applications—is not always plausible. There are a variety of options available to providers depending on what they need from health IT. And even once a provider's requirements are determined, there is still likely to be more than one tool, application, or system available. Thus, it is highly likely that an area hospital may use resource A, while the nearby primary care office uses resource B—making their ability to efficiently and effectively share information much more difficult. Many entities resort to faxing or snail mail in these cases, which can delay the receipt of data and overload the receiver with unnecessary detail. Such roadblocks exist not only between external providers but also from within integrated care systems. It is not uncommon for there to be separate health information systems for behavioral health care and primary health care. This means that even within the same office/network, providers may not be privy to information that directly affects their patients. "Some people don't talk at all," Doone says. "It is kind of siloed and different for every organization." A more specific challenge in the use of technology lies in billing. As aforementioned, payers—most commonly insurance companies—are not adept at relaying information. This can impede services, particularly when a patient has more than one provider. Were a payer to relay that provider A is offering one service while provider B offers another, both health care professionals would have the opportunity to ensure that the services are complementary rather than contradictory. Outside of the lack of bilateral communication, electronic billing can present a challenge when providers are unaware of how to properly code their services. This is less of an obstacle in larger health networks that have the resources needed to hire professional coders. However, for smaller facilities, the responsibility falls to the provider. "This is you asserting that you ought to be paid," Parks says of billing. "If you routinely get it wrong and there's an audit, you can be accused of false billing." As important as proper coding is, it is not something taught in school. "That's something you learn on your first job," Parks notes. "You don't learn it on clinical rounds. [The argument is] that people should not have to learn billing until they have some base knowledge." With all of the challenges that exist, what then is the point in even trying to share data? To put it simply, improvement. "[Technology] really is our major tool for improving quality of care, because you can't improve anything unless you can measure it," Parks says. Doone agrees, noting that at CCMCN, they are "using data and technology to improve lives and help those that are really doing the improvement"—the care team. Thus, it is vital that solutions be found to offset if not eliminate existing challenges. There is no clear first step to this, but there are multiple small steps that can be taken. First, providers and networks need to invest not only in technology but also in people who can work to learn, refine, and effectively use the tools available. No system is perfect. Without the right staff, information gathered is more likely to be wrong. CCMCN experienced this firsthand prior to Doone's hiring. At the time, CCMCN had purchased an application through a vendor to integrate the gathered data into a single view. However, due to a time lapse between a hospital visit and a claim, duplicate care plans were created. "We would have a hospital visit, and that would trigger a care plan. Then, three months later, the claim would come through and it would trigger a duplicate. We had hundreds of thousands of duplicates," Doone says. CCMCN now employs a team of individuals to help scrub the data and ensure that such glitches don't occur. In addition to having people who understand data, it's important to start small, Parks says. "You can't do everything all at once. It's hard for organizations to focus on improving more than two or three things at once. When you get that straight, go onto the next," he says. 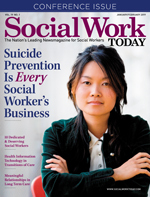 As for social workers specifically, Parks suggests that "clinicians insist to their organization that they want to see more data where they can see how they're delivering care compared to their peers." Until everyone in health care recognizes the importance of effective data sharing, none of the challenges that exist will be overcome.